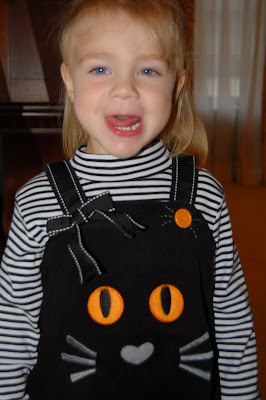 Micah Claire has been ready for Halloween for weeks now. 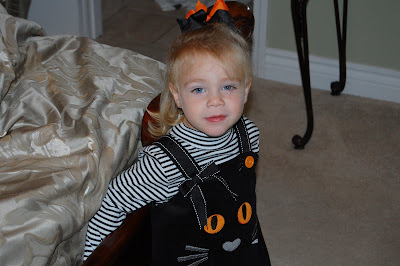 She has been saying Trick or treat and Candy so much it's been driving is bonkers! 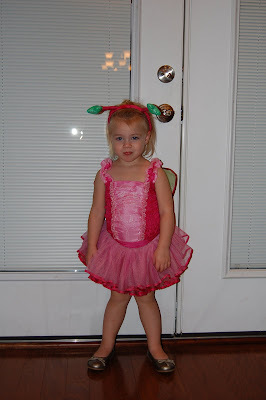 She was a butterfly this year, but she called it Tinkerbell so we went with it. 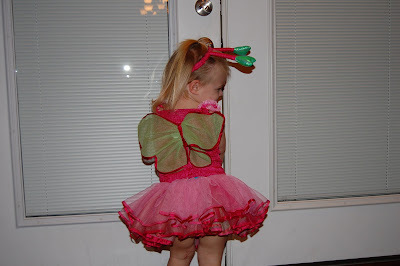 She wasn't as happy for her momma to take her picture though, as you can tell Check out those wings! 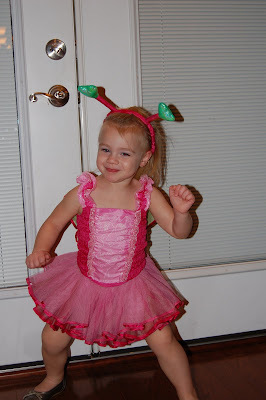 I finally got some action and smiles when I told her she could dance! 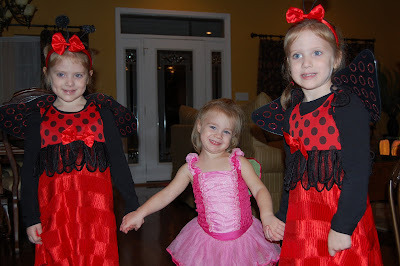 Then her very two favorite lady bugs showed up, Lainee and Gracee. 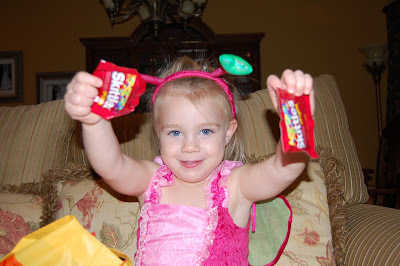 Skittles, her new favorite candy! And as you can see was extremely happy! She did so much flying around her wing fell off, but Ms. Traci came to the rescue and fixed her right back up! A candy necklace. 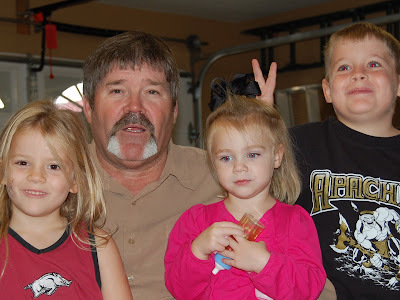 I tell ya what Grandparents just don't listen to well to Mommy's and Daddy's! And then our man Tucker made his arrival. 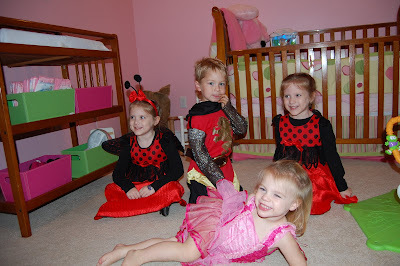 We tried really had to get all 4 of these kidos in one perfect picture; but it just didn't work out. This is about as good as we could get. 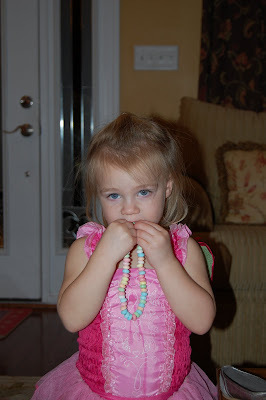 Her brilliant Poppa gave her an M&M thinking that would make her happy...... and well..... this is the picture I got. Oh well, I love her...... chocolate teeth and all! This morning we headed out to Mt. 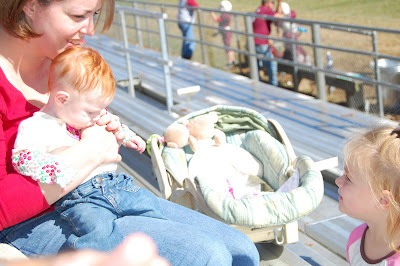 Ida to watch cousin Colton play his last football game of the season. 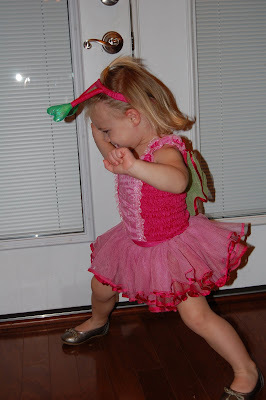 Micah Claire was more than ready to go, go, go! 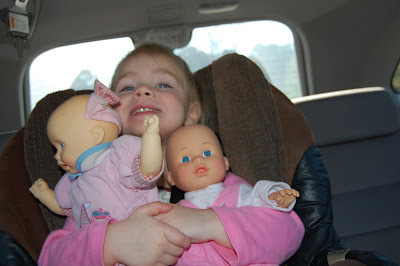 She had to make sure she her babies BayBay and Maddie came along for the ride too! 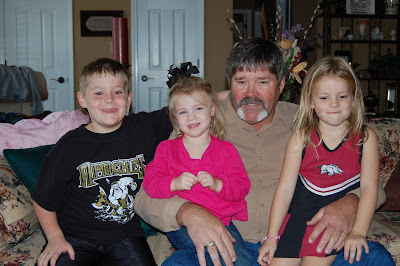 We made stop in Glenwood to eat at Pizza Shack with Uncle Carl and his family. 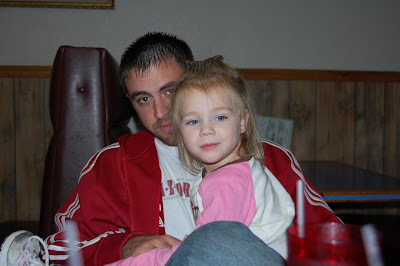 I got a picture of M.C and Daddy there, but for some silly reason I didn't take a picture of baby Carley. But if you've ever seen Carl Jones you've seen Carley Jo Jones because she looks JUST like him! Then it was on to Mt. Ida for some football! 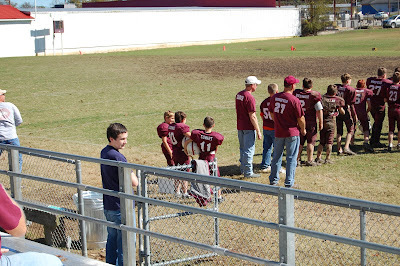 Cousin Colton got to be a captain at this game. 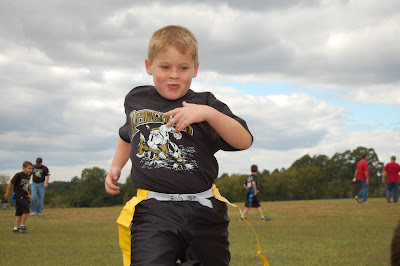 Turns out he was the star of the game; he scored TWO TOUCHDOWNS!!!!!! M.C. 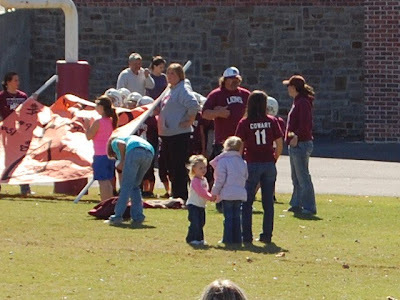 went out with Aunt Stacy and cousin Emily to watch the boys run threw the sign! It was so hot and bright out side that M.C. 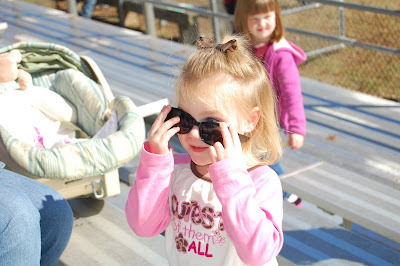 had to borrow her mommy's sunglasses. 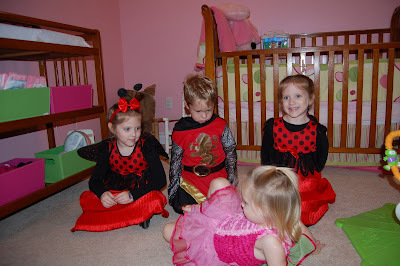 And guess who was there......... Yep....... Cousin Madelyn! 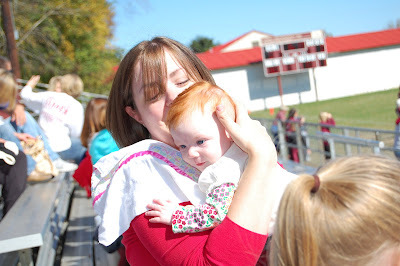 M.C had so much fun playing with her that she didn't watch hardly any of the foot ball game. M.C. watching Madelyn's every move. 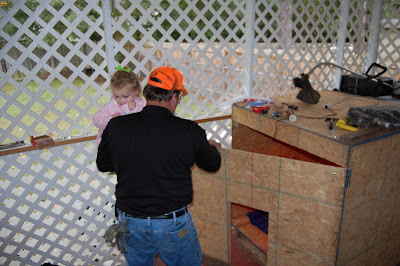 She even got to help Aunt Mandee make her a bottle! It was well past M.C's nap time when we finally hit the room home. 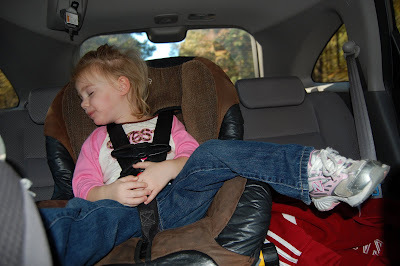 As you can tell she sprawled out and slept the entire way home. 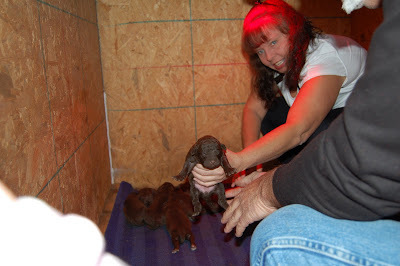 A few weeks ago, Papaw Barry and Ms. Debbie's Chesapeake had 10 puppies. 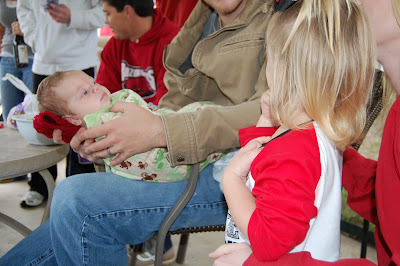 Micah Claire was hesitant at first to see them, but it was love at first sight. Since that first visit she was asked everyday to go see the puppies. Ms. Debbie showing M.C. 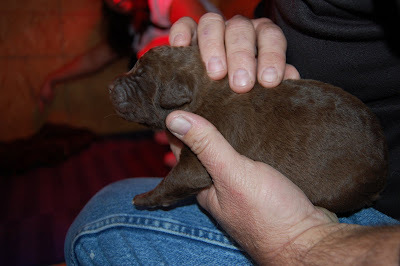 the only boy puppy! 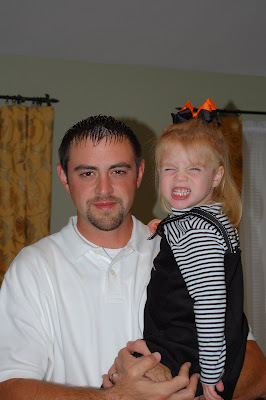 Aren't they sweet! 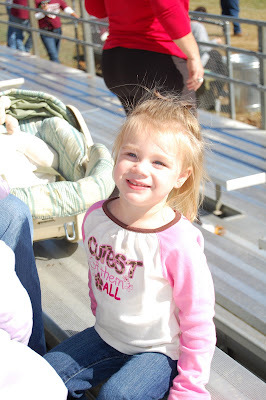 Last weekend Micah Claire and I made the long trip to Russellville to watch cousin Jon's flag football game. 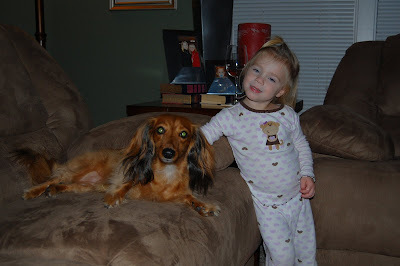 She had a great time visiting and playing with her 2 cousins Sara and Jon. M.C. 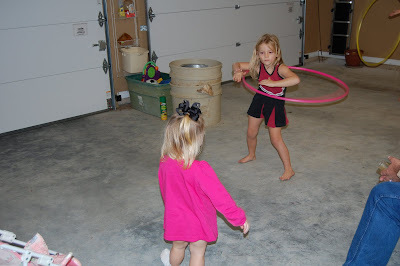 was fascinated at how well Sara & Jon could hola hoop! 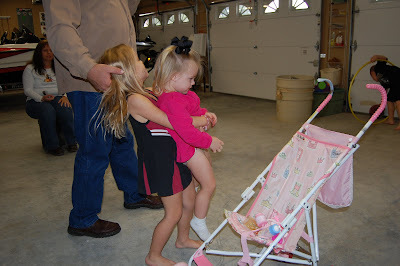 I think Sara enjoyed carrying M.C around like a little baby and pushing her in the stroller. M.C. 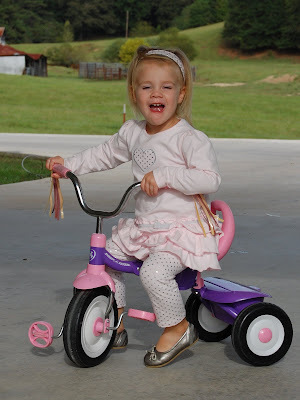 even tried riding Sara's big girl bicycle. 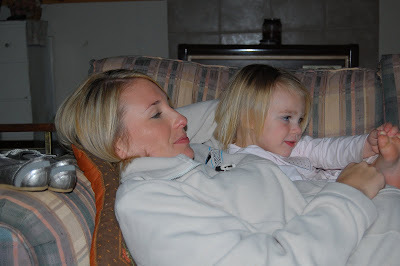 These two girls had a blast together. 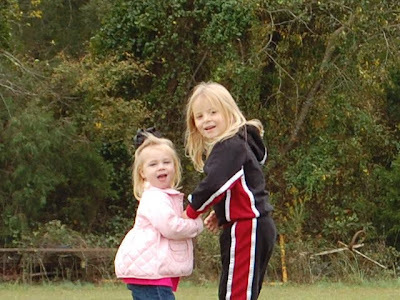 They were INSEPARABLE our as I call them "double trouble!" 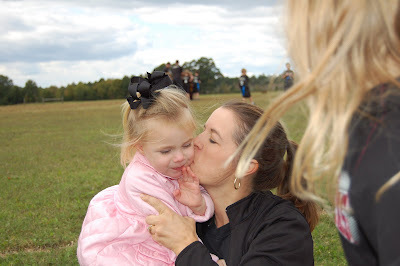 Aunt Laura stealing some of M.C's sweet kisses. Cousins Jon running over to visit with us during his time out break. I just had to post this picture of these 3 boys. 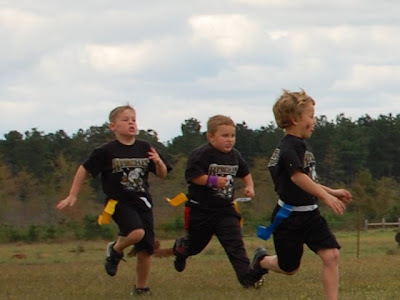 Each one of them was giving there all to the football game; so intense! A few days before Micah Claire turned 1 years old we found ourselves in the ER after she ate one bite of an egg. So our doctor recommended we do a blood test to see what other allergies she might have. 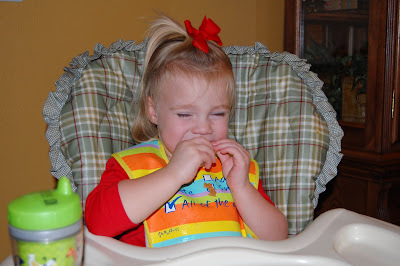 A few weeks later we found out she had an egg, milk, wheat and peanut allergy. We have tired like heck to avoid all those foods for the last year. I attended a conference for work a few weeks ago. One of the speakers was a specialist in pediatric food allergies. He said 87% of children will out grow all "mild" allergies by age 2 and the other 13% will out grow them by age 3. All of M.C's allergies are mild expect for the egg allergy. So over the last few weeks I have been slowly introducing skim milk and whole wheat pastas in her diet and we have had NO PROBLEMS!!!!!!!! I have been more hesitant and careful with the peanut allergy. She has had peanut butter cracker with no problems so far!!!! I think it will be a REALLY long time before I jump off and try to give her a peanut butter sandwich.... but I will take the progress! 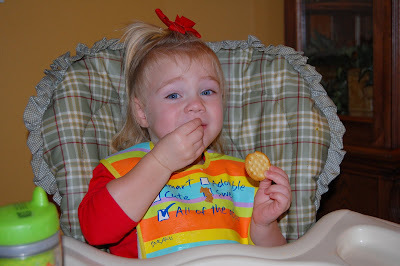 Her first into a peanut butter cracker! 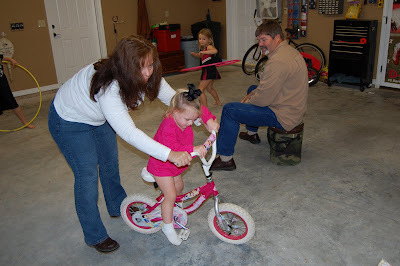 And as you can tell she LOVED it! 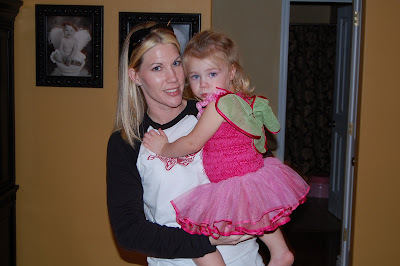 And Mommy loved that she had no reaction to it! 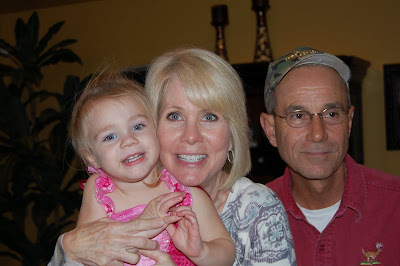 Last Friday night Micah Claire made her 1st trip to Magnolia to see Aunt Ashley and Uncle Eric. She was extremely excited to go visit them. She loved taking a bath in their pink tub! 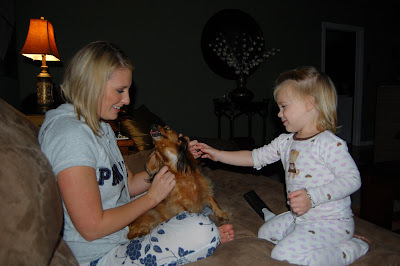 She had a blast playing with Daisy and Gracie. Too cute! 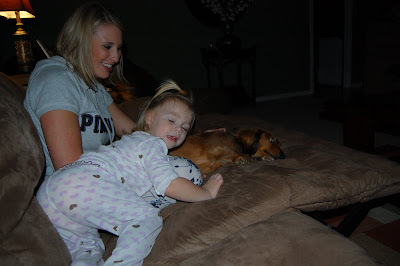 She was so full of excitement and energy that she didn't go to sleep till 11:15pm. I thought for sure she would sleep in since she stayed up so late. But, of course I was wrong she was up at 7am! 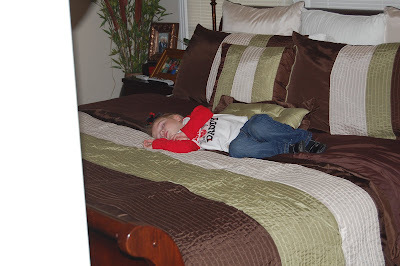 She was so tired by 10am the next morning she took a 2.5 hour nap and missed most of the Razorback game! And then Baby Gibson showed up and she was beside herself. She wanted to hold him and kiss all over him. Isn't he a cutie pie! M.C. checking Gibson out. 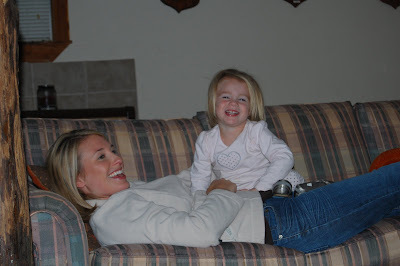 M.C sitting with Ms. Sara and baby Gibson. 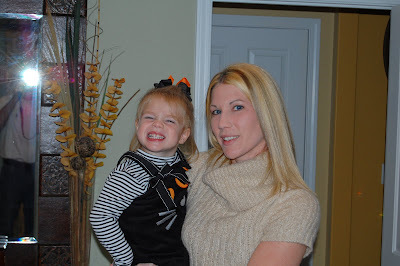 Last Friday night Ms. Shannon and Cadie Belle stopped by for a visit. 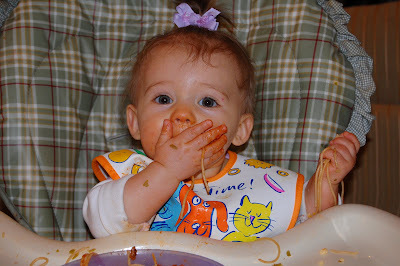 Cadie has a blast eating Micah Claire's spaghetti, as you can see! 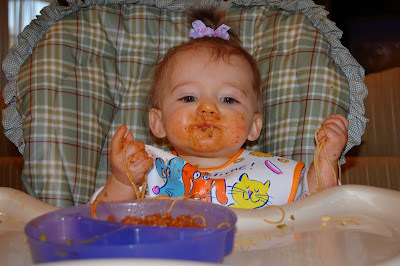 Now, that's one messy little face! 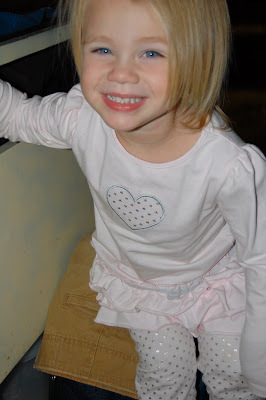 Saturday night we made a trip to deer camp to visit Daddy, Uncle Eric and Poppa Stan. 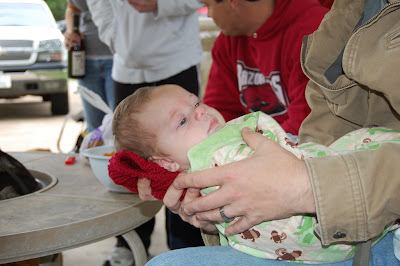 Micah Claire had a great time visiting and watching the Razorback game. M.C. 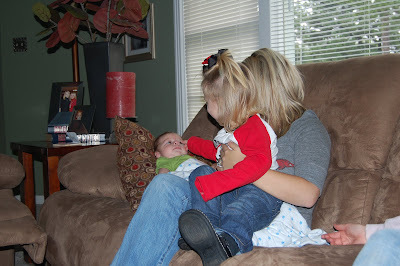 showing Aunt Ashley her hurt toe! 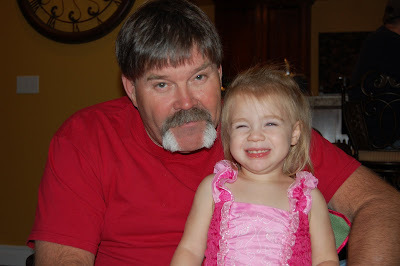 Sweet smiles and laughs! 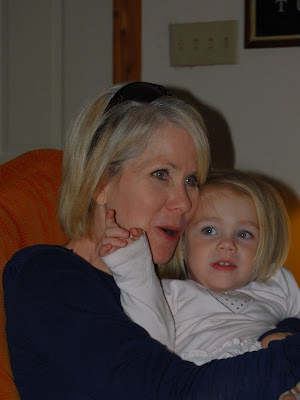 Even Nana got some snuggle time with M.C. 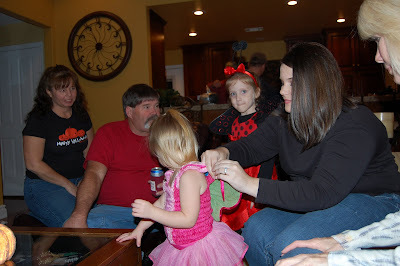 Sunday Micah Claire turned 25 months old and got sported the new "Kitty Cat" dress that Nana got her. 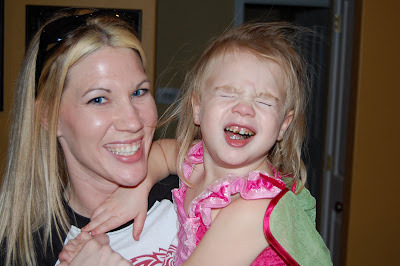 I am soooo ready for this child to quit making this face EVERY TIME I pull the camera out. M.C. 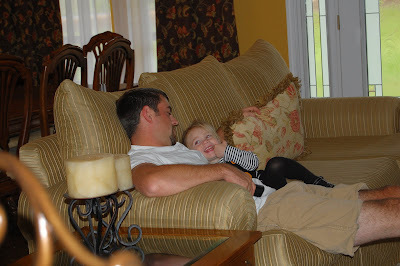 and her daddy watching some Sunday football. After a year of hardly any hair growth, this child's hair is growing like crazy! 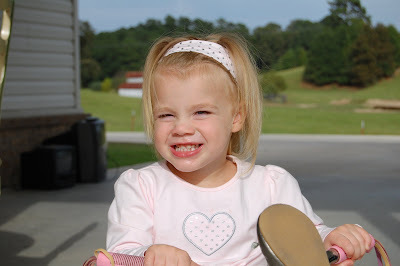 This was her first time to get to wear a headband. 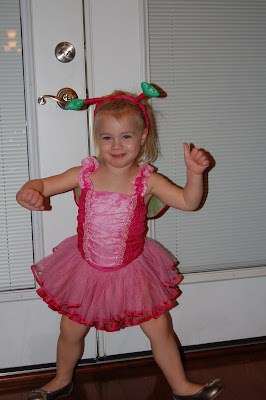 She liked to look at it and wear it on her wrist, but she wasn't too pumped about actually wearing it. M.C showing off her new slipper shoes! 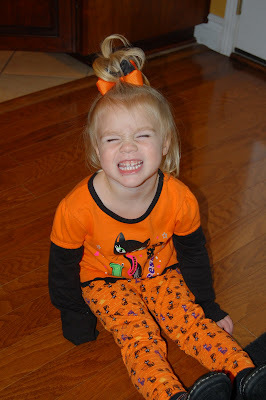 Micah Claire loves her Halloween outfit that our neighbor Ms. Sandy got her! YEP... there's that face again! Mimi came last night and spent the night with us. Micah Claire was so excited to see her. She and Mimi played hard all morning while Mommy cleaned house. 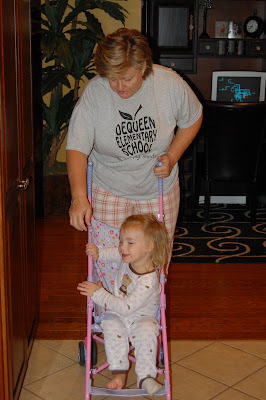 It was nice to get to clean my house without my little helper under foot! Thanks Mimi!!! 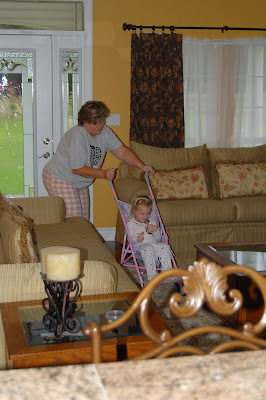 I think Mimi got a workout pushing M.C around the house all morning long!